Edmond, OK is defined by its quiet spaces, established ranches and functioning farms.The lifestyle that awaits you as a purveyor of space is readily available to you as you look for homes with 1 plus acres in Edmond, OK. A growing population offers opportunities for employment as many businesses relocate to this business friendly area. Additionally, Edmond, OK is just around 30 minutes from Oklahoma City’s epicenter. Edmond, OK also boasts an incredibly low 2012 unemployment average of just 3.4%. All of this is accentuated by the fact, that the mean average household income is $68,057 that is well above the state average of $41,664, which affords the employers in the area paying well above the state average. If you are looking to homestead in an area nearly devoid of crime, while being near a sales area, a better location will be very hard to find. Homesteading offers a tangible and profitable enterprise being within 30 minutes to Oklahoma center city while still maintaining a farm environment. Looking for fresh produce or options for sales directly in Edmond, OK? They boast a very large county organized farm market where direct growers can sell and buy produce freshly picked. Home values have made a modest decline from the high of $200,000 to a value price at $180,000. Picking that perfect home on the perfect piece of property is much closer in reach than one might imagine. The strength of this market is obvious as the decline has only been 10% from the average high compared to the national real estate adjustment averaging down 40%. Buying now, before properties begin to rise again, is a wise investment and a sure savings. Great public school define this location as over 95% of students graduate from this area with the area now having almost 50% of its residents with a Bachelors or higher level education. All of Oklahoma City’s over 20 colleges and universities are available the person who chooses to pursue a higher education while being under an hour to any of them, some within mere minutes. The renowned Oklahoma State University is just 15 miles from Edmond. Given the average age of homes here is well below the state average, finding a large amount of available properties with 1 plus acres in Edmond, OK is a snap. City data has ranked Edmond, OK as #84 on its list of Top 100 cities with largest land areas and #91 on its top 100 cities with newest houses. 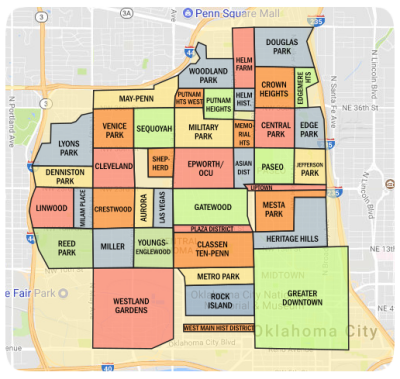 A low population density offers the wide availability of homes with acreage while still having all of the benefits of Oklahoma City available to the new homeowner. Being entertained with the vast availability and accessibility of entertainment options of Oklahoma City proper is still well under an hour’s travel from Edmond, OK. Be sure to check out the 4 major arenas, upscale shopping, large number of great restaurants and the Award Winning Zoo. 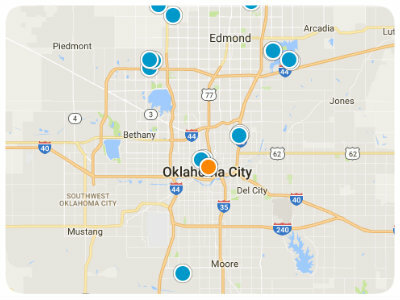 A night away from your spread is well within your reach as most arenas are around just 30 minutes from Edmond, OK. The abundance of entertainment offered within Oklahoma City ranges from Major events to nights out. Micro Breweries have become very popular in the area, to enjoy some local and relevant flavors. The Bricktown district offers an overwhelming appeal for the foodie and great upscale shopping to satisfy the most discerning of shoppers. As Edmond, OK has been ranked within the top 100 safest cities do not miss out on this opportunity to get a great home with plenty of acreage, at a great price that is certain to soar in the future. Its proximity to everything that is needed makes this location apt to fill your every need. Great location in Deer Creek area with approx. 448 ft of frontage on Highway 74. A little over 10 acres of prime land.